Located southwest of the Korean Peninsula is the largest island of Korea - Jeju Island. The island is one of the most relaxing vacation spot found in Korea thanks to its unique local atmosphere and beautiful natural environment. Among the many breathtaking spots to check out on the island, Seongsan Ilchulbong Peak, Manjanggul Cave, and Hallasan National Park are must-visit natural attractions. These attractions are part of Jeju Island’s volcanic lava tubes that take up 10% of the island’s total land area that are designated by UNESCO as a World’s Natural Heritage Site. If you want to explore more of Jeju’s diverse attractions including the aforementioned natural sites, read on to see what the island has to offer for a stress-free, relaxing retreat that can be divided into three different sections: Dongbu World Natural Heritage Site Course, Seogwipo & Jungmung Tourist Complex Course, and Jeju Downtown History & Culture Course. 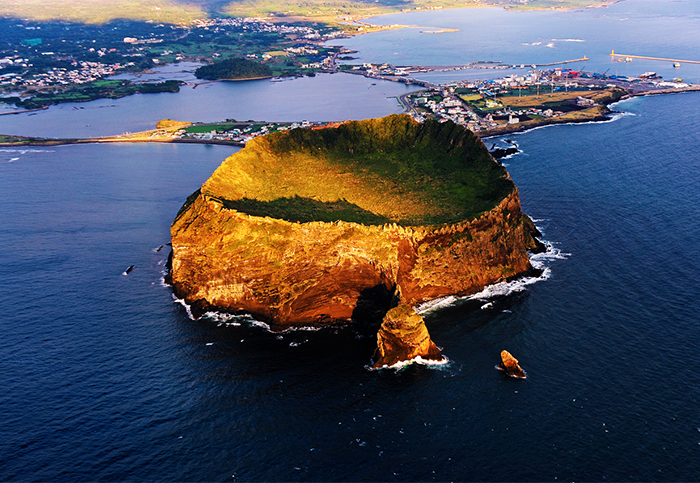 Seongsan Ilchulbong Peak, dubbed as Jeju's landmark, was formed from a volcanic activity that erupted about 5,000 years ago from the ocean bottom. Due to its distinguishable geological feature and resemblance to a castle, the rock formation was named seongsan, which can literally be translated as “the mountain castle.” Seongsan Ilchulbong Peak is especially famous as a viewing spot for sunrise, known to be one of the top ten exquisite sceneries of Jeju Island. Besides viewing the sunrise, Seongsan Ilchulbong Peak is also known to be an excellent trekking spot. Its Seongsan-Ojo-ri Trail is especially popular among trekkers as the route connects Seongsan-ri to Ojo-ri Village with the rock’s peak at its center. 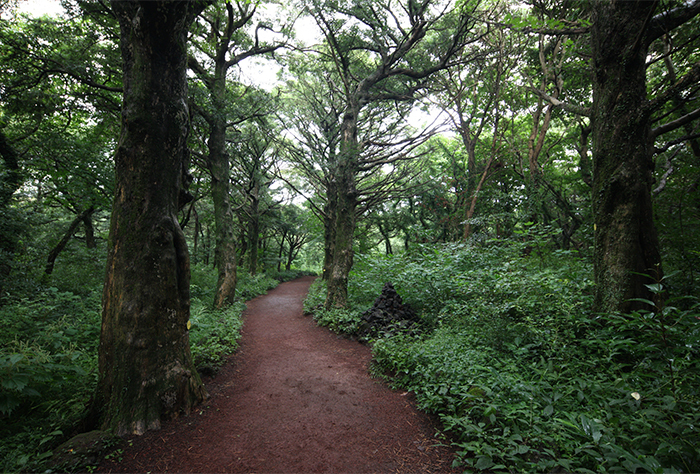 Another popular trail, the Jijil Trail offers a closer look at the world heritage site as well as Jeju’s local culture. The trail is easy on the feet even for beginner trekkers. Seongsan Ilchulbong Peak is also reachable through a hiking trail that starts from the nearby village. A unique performance stage is also prepared at Seongsan Ilchulbong Peak where haenyeo (female divers) hold special performances related to diving. * Schedule subject to change depending on weather conditions and divers. 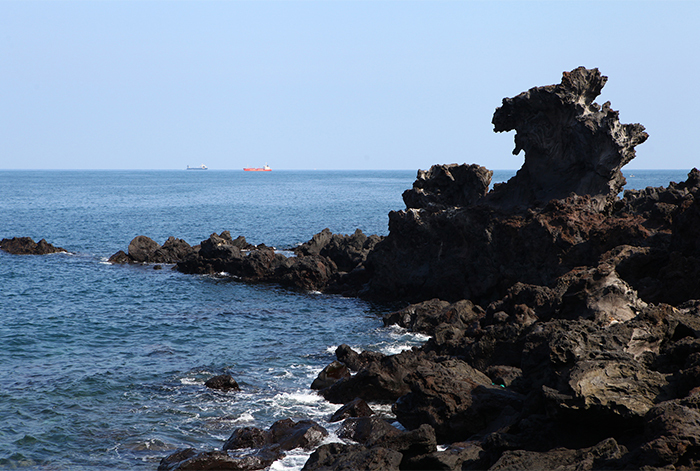 A seven to eight minute drive from Seongsan Ilchulbong Peak will take you to Seopjikoji, which earned the name meaning “Cape of Small Land” in Jeju dialect due its peculiar cliff formation that protrudes toward the ocean. The picturesque harmony of the hill and blue ocean waters attract tourists all year round. 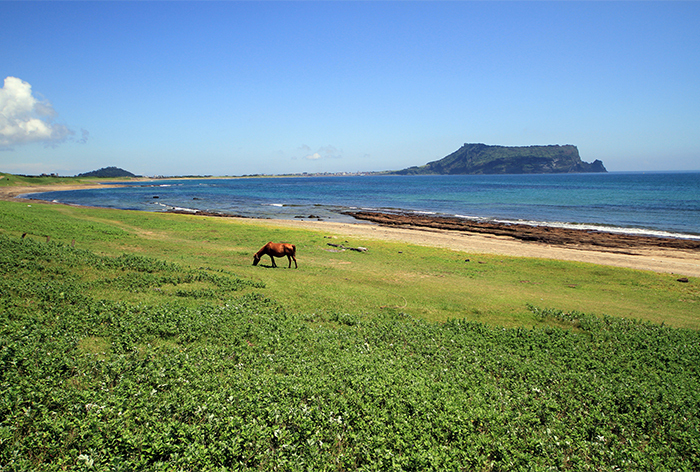 You might even be able to sight Jeju ponies grazing on the field of grass as you approach the entrance of Seopjikoji. Towards the northeast of the cliff is a peak called “Red Oreum,” offering an exquisite view of a white lighthouse with dark blue sea in the background. Another noteworthy beauty of Seopjikoji is the Glasshouse and Yumin Art Gallery, two masterpieces designed by world-renowned architect Ando Tadao. The two buildings blend in remarkably well with the surrounding nature, landing them on the top of the list to see while at Soepjikoji. You can’t say you’ve been to Jeju Island without visiting one of the many oreums. 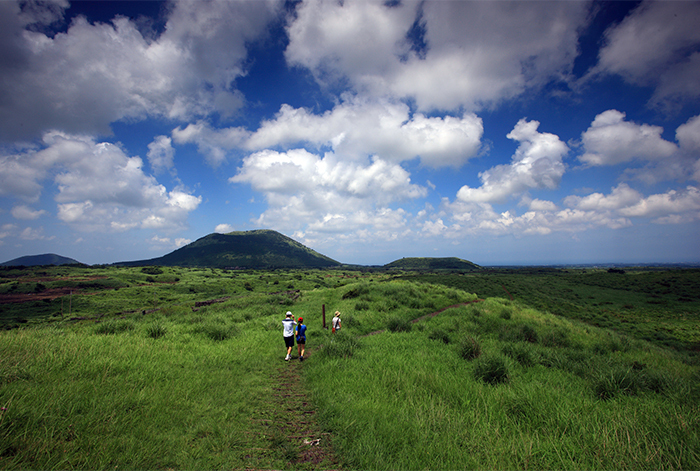 There are approximately 360 oruems, or parasitic volcanoes, scattered out on several hilltops of various locations in Jeju. Among these hundreds of oruems, the Yongnuni Oreum is undoubtedly the most well known. It’s not far from Seongsan Ilchulbong Peak and has a moderately gentle slope as compared to others, providing a fairly convenient trail for trekking. Upon reaching its top, Seongsan Ilchulbong Peak and Udo Island come into view, offering an unforgettable experience. The view of curvy ridges along with the ocean also serves as an excellent backdrop for memorable photos. If you are looking for a perfect spot for souvenir photos, Yongnuni Oreum will not be a disappointment. In contrast to Yongnuni Oreum’s open view of the ocean, Bijarim Forest is an ideal spot for a relaxing forest retreat. This botanical garden, housed with heavy dense bija (nutmeg yew) trees, is ranked top for being the largest forest for having made up of one plant species. Large clusters of the trees have lived for at least 500 to 700 years, giving its nickname “Forest of Thousand Years.” A must-see sight while at Bijarim Forest is non-other than the 800-year old conjoined nutmeg yews. Geomun Oreum is another noteworthy oreum on Jeju Island. 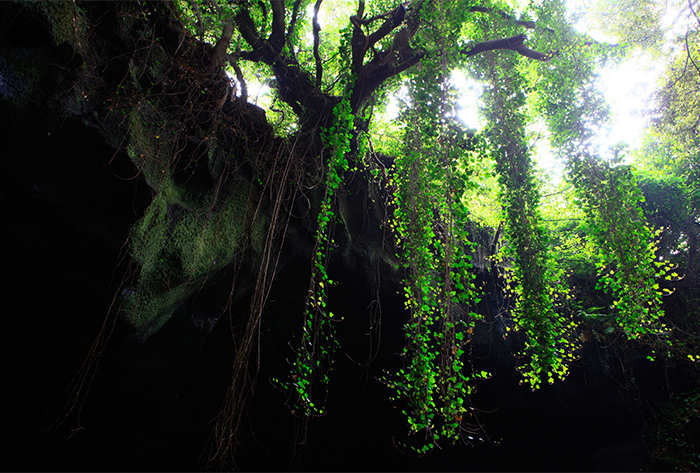 Out of the five volcanic caves forming Geomun Oreum, Manjanggul Cave is the only cave open to the public. With its profoundly mysterious and grandeur appearance, taking a step inside the cave is like stepping into Hades’ underworld. Follow the tunnel of articulate lava rock formations, and you will soon reach a giant rock pillar that indicates the end of the cave. The cave’s temperature fluctuates within 11-21℃ regardless of season, allowing visitors to enjoy the magnificent cave all year round. 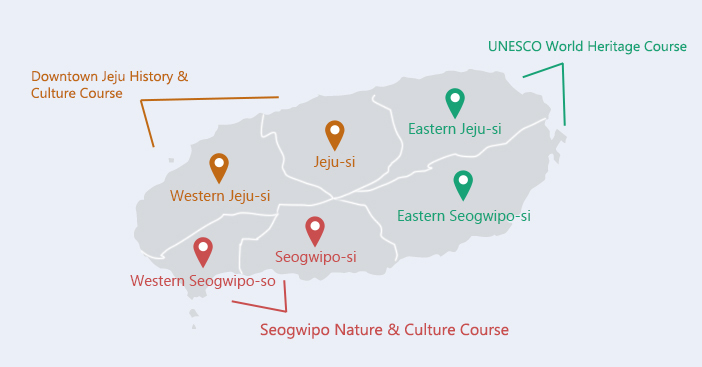 Seogwipo, which expands to include the entire southern half of Jeju, exhibits a great amount of sunshine and warm temperature that is almost similar to that of a tropical climate. While the moderate climate attracts crowds of tourist to the area, Jeongbang Fall adds another reason to visit Seogwipo. 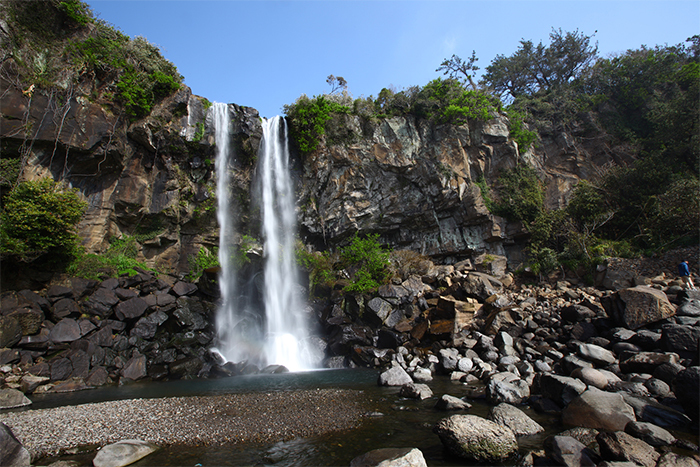 Considered as one of the top three waterfalls on Jeju Island, a glance down of the waterfall crashing down into the ocean atop the 23-m high cliff will surely have goose bumps running all over your body. Behind Jeongbang Falls and you will find the Waljong Art Gallery. This gallery belongs to a Korean artist named Lee Wal Chong, who settled in Jeju decades ago. The gallery is filled with his inspiring artworks, expressing the beauty of Jeju onto his canvas in his own unique way. The strategic location and the glass wall interior of the building also offer visitors an amazing view looking over the Seogwipo Sea. Jungmun Tourist Complex is blessed with not only beautiful natural sceneries but also filled with numerous entertainment and convenient facilities catering to both domestic and international tourists. Near the International Convention Center Jeju, Jusangjeolli Cliff delivers a sight to behold with its gigantic rock pillars running along the costal line. These beautiful hexagonal columnar formations will spread before your eyes, offering breathtaking vistas in addition to the nice promenade. Cheonjeyeon Falls is another attraction not to be missed out in Seogwipo. Cheonjeyeon Falls is a three-tiered waterfall that plunges in three segments. In contrast to the second and third segments that have water cascading down all year round, the first segment remains dry and has water pouring only after rainfall. Another favorite tourist attraction at Jungmun Tourist Complex is the Teddy Bear Museum. The museum boasts quite an impressive collection of teddy bears from all over the world. Exhibition halls are designed with different themes related to teddy bears, such as 20th century history exhibition and fable parodies portrayed by teddy bears. The Teddy Bear Museum is a popular museum loved by visitors of all ages, recommended as an excellent place to visit with friends, families, or even on a date. The museum also has an outdoor souvenir shop, cafeteria, and a park that offers a splendid view. 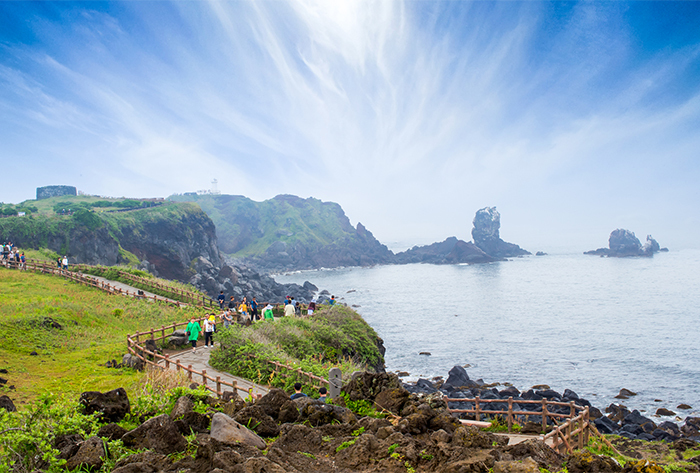 Yongduam Rock, undeniably Jeju City's top tourist attraction, is one of the many natural wonders of Jeju Island. Formed by underwater lava millions years ago, eons of weathering from the rain and wind have formed it into the likeness of a dragon's head. 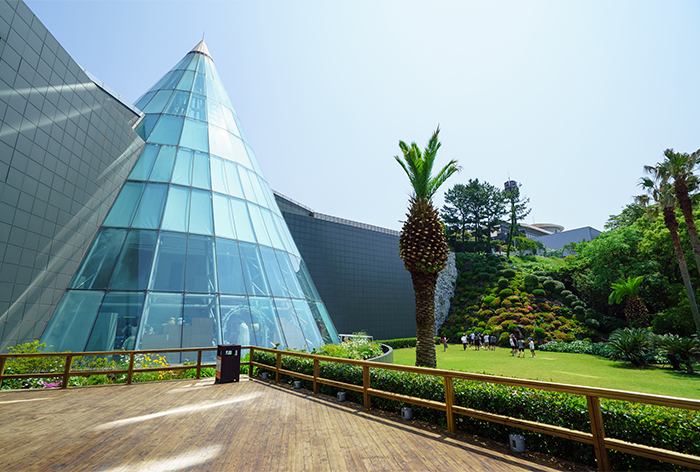 After visiting Yongduam Rock, head down to the Jeju Folklore & Natural History Museum to get a glimpse of how Jeju Island developed overtime since people first began to settle. Not only does Jeju Island have its own dialect, it also has a distinct culture that separates from the rest of mainland Korea, all of which you can see and enjoy from a quick tour of the museum. Right next to the museum is Samseonghyeol, a religious site that is also the birthplace of Jeju's ancient mythology. Samseonghyeol is not only historically significant, but it is also a fascinating ecological site. Though it may be small, the area has a captivating energy that you will certainly not forget. * This column was last updated on July 2017, and therefore information may differ from what is presented here. We advise you to check details from the official website before visiting.